Apparently, the latest thing in political correctness, at least among politicians on Capitol Hill, is to wear an American flag pin attached to the left lapel of your suit. Yep, it seems like all you have to do is pierce that flag pin through your lapel and your patriotism will never be questioned. Go ahead. Spend your weekends funneling money to terrorist organizations or building explosive suicide belts in your basement. It doesn’t matter you see because by wearing the pin that proves you are a true patriot. It’s Washington’s version of a “Get out of Jail Free” card. It’s like having Uncle Sam behind you with a hand on your left shoulder and Betsy Ross with a hand on your right shoulder. Don’t you dare question my patriotism, boy! Can’t you see I’m wearing an American flag pin? 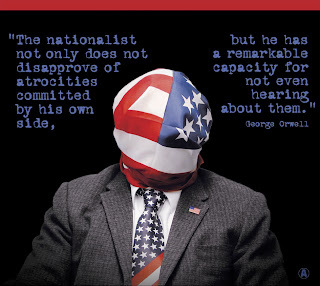 Most of us with brain matter realize flag pins say zero about your patriotism. Astoundingly, a sizeable number of people, particularly on Capitol Hill and in the right wing media actually think that the absence of a flag suggests that you are unpatriotic. Sadly, this says volumes about the state of patriotism in our country. Many can no longer detect the real thing when they see it. Really, it’s time to give these people some emergency oxygen because they are starting to hallucinate. I always thought that saying you are patriotic and actually being patriotic were two different things. But I guess I must have been raised by godless, left wing commies. Really, I could care less whether a politician wears a flag pin since it means nothing, nothing! However, I am interested in knowing what actions during the course of a politician’s life they can point to that demonstrates their patriotism. To me the most patriotic thing anyone can do is fight for our country. John McCain fought for our country as part of what turned out to be a wholly misguided war in Vietnam. He was held as a prisoner of war by the North Vietnamese, who abused and tortured him over many years. While I did not agree with the war, I honor and respect John McCain’s patriotism. Unquestionably, John McCain is a patriot. The same is true with John Kerry. Granted not all soldiers put their lives in danger but those that do unequivocally demonstrate their patriotism, even if sometimes they no not feel particularly patriotic for having done so. Anyone who would criticize John McCain or John Kerry’s patriotism because they do not wear an American flag lapel pin is a damned fool. Clearly, there are ways to demonstrate patriotism other than becoming a soldier. Our government’s efforts in the wake of Hurricane Katrina may have been half-hearted, but ordinary citizens by the thousands showed their patriotism. They spent time, effort and money going to the Gulf Coast to help in its rebuilding, a process that is still underway nearly three years later. I gave money for rebuilding, which did not feel particularly patriotic but was expeditious. My friend Renee’s son spent a year working for Americorps including some months in and around New Orleans rebuilding housing. He invested a year of his life helping his fellow citizens. He is a patriot. In the recent ABC News debate, Barack Obama pointed to his work in the Senate on legislation for veterans as one way that he demonstrated patriotism. No, Obama never served in the armed forces. However, after graduating from law school he did make the choice to foreswear a more lucrative and moneyed life in favor of community organizing. He certainly had the talent to be a six-figure lawyer. Instead, he chose civic engagement, initially through community organizing and later by spending eight years in the Illinois Senate and subsequently the U.S. Senate. He and his wife carried the burden of their student loans into their forties. He might still be paying off his student loans had he not written a few best selling and not so best selling books. To me Obama’s patriotism is beyond dispute. So why are some, including many in the press, obsessed that he only sporadically wears an American flag lapel pin? It beats the hell out of me. Frankly, it says much more about their character than it does about Obama’s. It’s like, “What was all that other stuff he was doing since he graduated if not an expression of patriotism?” Community organizing to better the lives of the working poor is no more patriotic than shuffling papers for well moneyed clients at expensive Manhattan law firms? As I once noted, beliefs are irrelevant. I could believe I am a patriot, but if I do not demonstrate my beliefs in time, effort and money then patriotism simply amount to beliefs. Actions however matter very much because through action we change the course of events. How you choose to spend your time provides all the insight you need into someone’s character. It appears to some that unless your actions conform to some strange right-winger’s idea of patriotism then you are not really a patriot. It is curious that many of those criticizing Senator Obama and others for not wearing an American flag lapel pin have done little to nothing to demonstrate their patriotism other than wave the flag. Few of the people who led us into an unnecessary war with Iraq served in our armed forces. President Bush served in the Texas Air National Guard but it was widely understood that he did so in order to avoid being drafted. He ended up in the Texas Air National Guard only because of his father’s influence. Vice President Cheney had “other priorities” during the Vietnam War. He successfully dodged five draft attempts using educational deferments. Condoleeza Rice never came close to serving in the military. Richard Perle, who served on the Defense Advisory Board, which advocated the war, never served in the military. Nor did his special assistant Douglas Feith, who ran the Defense Department’s controversial Office of Special Plans, which advocated for the war. Most of those who shrilly promoted the war for the media did not serve either. Rush Limbaugh managed to attain 4-F draft status based on a football knee injury. Many of those who had, such John Kerry and Colin Powell, were at least grounded in the magnitude of these actions, and worked to prevent them. While I find much to admire about the United States, I also find much about it that appalls and disgusts me. These include our bloated defense budget and our tendency to use guns instead of diplomacy to solve our international problems. I certainly feel like a stakeholder of my country, as I was born here and will probably die here. While I have and will keep working to make this country a better place, I am also concerned about the world as a whole. I see little value in xenophobic patriotism. Nonetheless, I do occasionally feel patriotic. I do not wear an American flag lapel pin, but I feel fine putting our flag out on major national holidays. I can get misty when I hear the nation anthem played even though, frankly, it is poor choice for a national anthem. (Why not “America the Beautiful”?) I do take pride in our military, which is the best trained and equipped in the world. I am grateful for competence and professionalism of our military and deeply respect those who serve for our country. I am not naïve. I realize that it is due to our military that our homeland has remained at peace since the Civil War. I am not naïve enough to think we do not need a military. I certainly do not ascribe to the slogan, “My country, right or wrong”. My patriotism informs me that when my country is wrong, I have the duty to make it right. Which brings up something else that annoys me about these lapel pins. The real statement is that unless patriotism is reflexive, it is not real. It you are not a mouth organ for the state, particularly at a time of national crisis, you are not patriotic. Capitol Hill was awash with faux patriots in the days after 9/11. Politicians overwhelmingly marched in goosestep with the President when he said we had to invade Iraq. I did not. I worked like hell to prevent this war. A few politicians at the time bravely said no, this is a war we should not start. He was just a state senator at the time, but Barack Obama stood and spoke at a public antiwar rally and spoke out against this war. In doing so, he demonstrated that he is a true patriot.